This easy sangria is quick and refreshing. It is loaded with fresh summery flavor. Combine brandy, peach schnapps and fruit. Add white wine. Stir and refrigerate for up to 4 hours. To serve, add fruit from the jug to the bottom of a glass. Fill 3/4 with sangria. 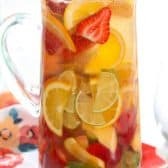 Top off with club soda or prosecco or gingerale if you prefer a sweeter sangria.